This recipe is such an easy one to make and absolutely delicious, making it an ideal weekday evening meal for two. Preheat the oven to 190°C, gas mark 5. Heat 2 tbsp of the oil in a medium flameproof roasting tin and add the onion and garlic. Cook, stirring, for 2 minutes until softened. Add the rice and stir to coat in the oil. Pour in the stock and season. Cover the tin with foil and bake in the oven for 25-30 minutes, until all the liquid has been absorbed and the rice is tender but still retains a little bite. Meanwhile, heat a griddle pan until hot. Rub the squid tubes and tentacles with the remaining oil and some seasoning. Lay them on the griddle pan and cook for 1-2 minutes each side. Transfer the squid to a board and cut into 1cm thick rings. 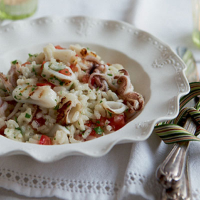 Stir the squid, tentacles, tomatoes and parsley into the risotto and serve straight away. This risotto would be just as good with prawns instead of squid. Use the same quantity of raw peeled tiger prawns and cook as the squid, making sure the prawns are pink and cooked through before adding to the risotto.